Buying a new home can be exciting and also pretty daunting, but all you need is ESPC. Maybe you’re buying your first home or perhaps you’re moving up the ladder? Either way, it’s a huge task, often with a major financial commitment. The ESPC experts are here to help you make the right decisions. The first thing to do is to find a solicitor. They will help you to understand the legal process and costs involved. Your ESPC solicitor estate agent will be able to guide you smoothly through the whole process to help you find your ideal home. Speak with an Independent Financial Adviser. The team here at ESPC Mortgages can help you find out how much you can borrow and what your repayments would be. The amount you can borrow will be based on your salary (or joint salaries if applying for a joint mortgage), combined with your spending habits and commitments. Getting a mortgage isn’t just about how much you can borrow – you also need to check you can afford it. At ESPC we think it’s essential to work out a realistic budget before you start house hunting. Use the ESPC budget planner to help. 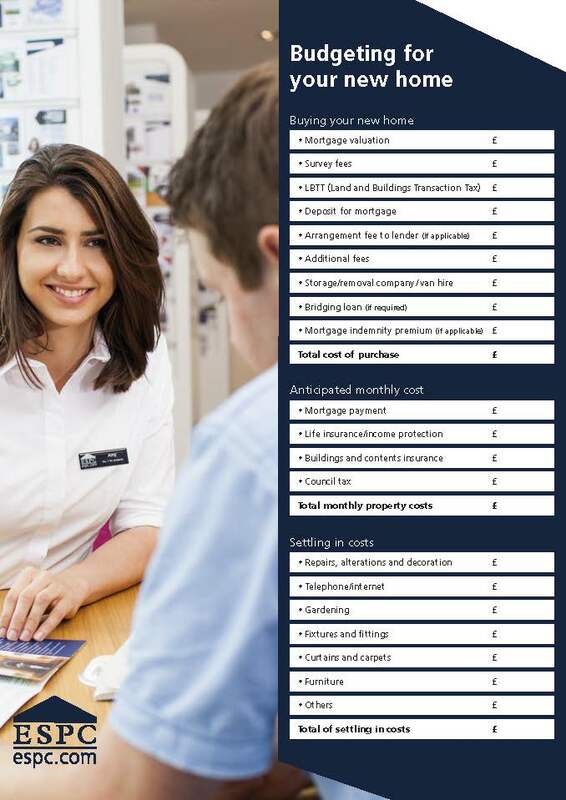 There are literally hundreds of mortgages out there and they are all called different things: fixed, variable or tracker rate. Different mortgages suit different people. With so many options, it makes sense to get independent advice. Our advisers can help you find the mortgage that’s right for you. We also recommend that you get an Agreement in Principle. It doesn’t commit you to taking out that particular mortgage, but it lets you start house hunting in confidence because the first stage of the approval process is out of the way. It’s now time to start your search. ESPC has thousands of local homes for sale, so browsing our website or weekly paper is the ideal place to start. Remember to sign up for property alerts to be told first of new properties and get all the latest property news. Once you’ve seen a few properties you’ll soon become an expert at seeing past things you don’t like (such as bad décor) which can be easily changed. If you see somewhere you like, always go back for a second viewing, ideally at a different time of day. Take someone with you who can give an objective opinion. Make sure to use our handy viewing checklist. Found somewhere you love? Take a closer look at the Home Report. This contains three items: a Single Survey, a Property Questionnaire and an Energy Report and it can help you work out the condition of the property and make a more informed decision when placing an offer. Once you find a house you think you might buy, you need to speak to your solicitor. This is probably the trickiest part of the entire house buying process – deciding how much to bid. It requires market knowledge, commercial instinct and – just as important – a good slice of luck. Your solicitor pays a crucial part in this process. If you decide to go ahead, your solicitor will submit the formal offer. Once you’ve made an offer and it’s been accepted, you need to get your mortgage approved. If you’ve already got an Agreement in Principle, this stage should be a bit easier. Your IFA will help you every step of the way. Your solicitor will work to finalise the details of your offer at the same time that your mortgage is being approved. Every element of the agreement between you and the seller has to be negotiated, agreed and clearly set down in the contract, known in Scotland as the ‘missives’. This will include date of entry and what it or isn’t included in the sale. Your solicitor will go through the contract (missives) in detail before you formally agree terms (or ‘conclude the bargain’). Once this is all agreed you are legally obliged to pay for the property on the agreed date and similarly the seller is legally obliged to vacate the premises. You are now ready for the big move! Use our moving checklist to help. Find out more about Buying in Scotland. Come to one of our free property events. Sign up to our regular newsletters to get all of the latest property news.